I am a Pinterest Addict and have been for a little over one year. I was introduced to this delightful wonderland of eye candy by a friend via Facebook. As with anything new, it took a few days to acquaint myself with the ins and outs, but once I got the hang of it – BAM! I was hooked! The picture to the left was my very first “Repin”. 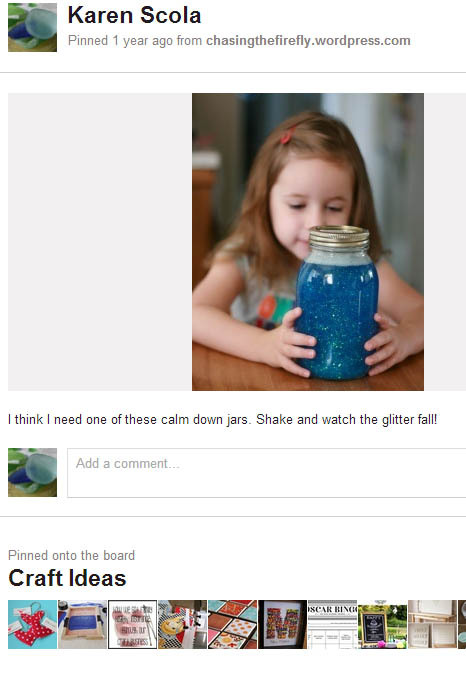 A calming jar tutorial! When you see something you like, you have the ability to set up your own boards and repin a pin to your board. 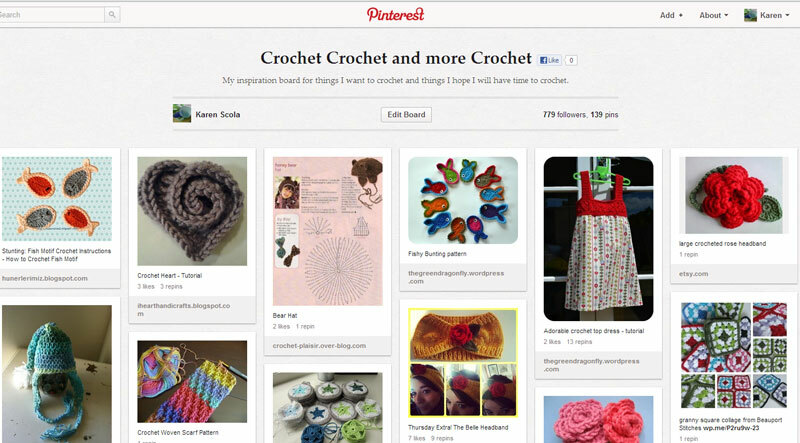 Pinterest also helps out by having a few already named boards to get you started. I spent less time searching for blogs or images on Google or Bing and more time searching for crochet and embroidery and food and sewing and fashion and, and…..so many other topics. It was like having a SMORGASBORD of websites and blogs all in one place, not to mention being introduced to people from all over the world in a way that traditional search engines could not. Thanks to this awesome piece of Social Media, I have tried out new recipes, discovered creative ways of gifting my niece and nephews with $$, adapted patterns for knit and crochet and shared many words of wisdom with my friends. There is a downside as well – some of the Pins lead no where. Pins are usually “Pinned” from an originating website or blog. It is disappointing to see something really neat click on it, such as a tutorial, and you are met with a dead end. A word of caution – it is so easy to spend hours without realizing the passing of time while engrossed in Pinterest. Set a timer and take periodic breaks! Do you Pinterest? Leave your Pinterest name in the comments so I can follow you!